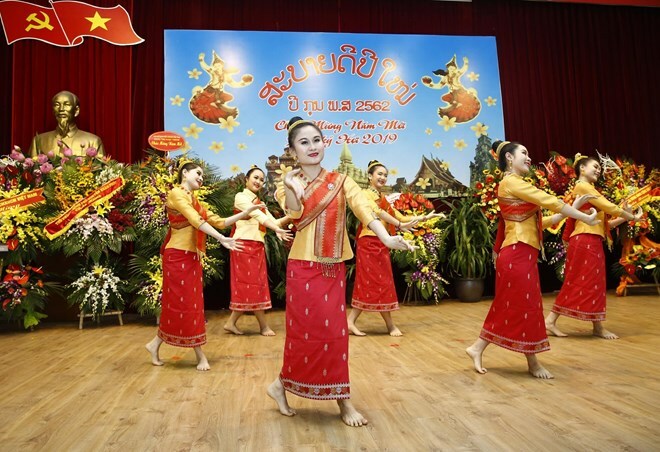 Hanoi (VNA) – The Lao Embassy in Hanoi held a celebration of the Lao traditional New Year festival Bunpimay on April 11. Guests at the event included Tran Quoc Vuong, Politburo member and standing member of the Communist Party of Vietnam Central Committee’s Secretariat; Tong Thi Phong, Politburo member and Standing Vice Chairwoman of the National Assembly; and Hoang Binh Quan, member of the Party Central Committee and head of the Party Central Committee’s Commission for External Relations. Addressing the event, Lao Ambassador to Vietnam Thongsavanh Phomvihane reviewed the great accomplishments made by the Lao people in the past year. He stressed that those achievements are made possible with the cooperation and the valuable and heartfelt support of the Vietnamese Party, State and people. In reply, NA Vice Chairwoman Tong Thi Phong said the Vietnamese Party, State and people always treasure the special ties with Laos, which has been fostered with efforts and sacrifice and many generations of leaders, armed forces and people of both countries. She affirmed that Vietnam will continue to join hands with Laos to preserve and develop the traditional solidarity and special friendship between the two countries, while promoting the bilateral comprehensive cooperation to a new high, thus meeting the aspiration and trust of their people and contributing to peace, stability, cooperation and prosperity in the region and the world.